The most powerful, portable Bluetooth speaker from JBL, the Boombox delivers monstrous sound launched in India on 12th March 2018. JBL Boombox is a Portable Bluetooth v4.2 Speaker that delivers an exceptional sound and hard hitting bass. To keep the music experience going for up to 24 hours the Boombox packs a huge, powerful and long-lasting 20000mAh battery inbuilt to provide non-stop party round-the-clock. With the addition of a dual charge out, music lovers won't have to worry about missing a beat, as their smart devices can be simultaneously charged while the music plays. This JBL Boombox portable speaker is priced at INR 34,990. It will be available at HARMAN's ecommerce platform - http://www.harmanaudio.in, including various online and retail channels and at 350 key Samsung brand stores across in India. This new launched JBL portable speaker packs a serious punch that enhances the overall experience with its mesmerizing sound quality and Bluetooth streaming experience. However it’s a portable speaker, still it weighs around 5.25kgs and it attains the big body size nearly 20 inches (50 cm) long. The JBL Boombox Seaker's large frame is equipped with four active transducers and two bass radiators, providing powerful sound and bass in a substantial-but portable-package. 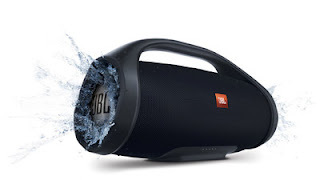 With an IPX7 rating, JBL Boombox features waterproof design. That gives permission to user take this device along with without any fear of Rainy Season or worrying about pool/ beach party or water submersion. The Boombox is rugged enough to withstand any weather conditions. For those looking to make the party even bigger, the Boombox can connect to more than 100 JBL Connect+ enabled speakers within Bluetooth range, taking the sound experience to an entirely new level with a touch of a button. Wireless Bluetooth Streaming: Wirelessly connect up to two smartphones or tablets to the speaker and take turns playing impressive stereo sound. High-capacity 20,000mAH rechargeable Battery: Built-in rechargeable Li-ion battery supports up to 24 hours of playtime and charges devices via dual USB ports. IPX7 Waterproof: Take Boombox to the beach or pool without worrying about rain, spills or submersion in water. JBL Connect+: Amplify your listening experience and rock the party by wirelessly connecting more than 100 JBL Connect+ enabled speakers. Monstrous Sound and Bass: Incorporated with four active transducers and two JBL bass radiators, JBL Boombox delivers monstrous sound along with hard hitting bass that listeners will not only hear but also see. Priced at Rs.34990/- and available in Black Color.